Hour One, Our live guest was Samuel K. Dolan who has a new book that explains a lot of how El Paso and Juarez reacted to Prohibition. Even after WWI had ended, the region of Arizona, New Mexico, and West Texas stubbornly refused to be tamed. It was still a place where frontier gunfights broke out at an alarming rate. 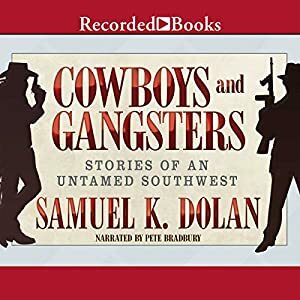 Utilizing official records, newspaper accounts, and oral histories, Cowboys and Gangsters tells the story of the untamed “Wild West” of the Prohibition era of the 1920s and early 1930s and introduces a rogues’ gallery of six-gun-packing Western gunfighters and lawmen. Blake Barrow was our guest for hour two of the April 2, 2016 program. He wrote the book on how a lawyer turned into the manager of the El Paso Rescue Mission.